Until less than a year ago, the nicotine patch was available by prescription (Rx) only. In July 1996, the Food and Drug Administration approved the "switch" of the Nicotrol patch to over-the-counter (OTC) status, following on the heels of a February 1996 switch of another stop-smoking aid containing nicotine, Nicorette gum. Then, on Aug. 2, FDA approved the switch of a second nicotine patch, Nicoderm CQ. The patch and gum join more than 600 other OTC drugs that, according to the Nonprescription Drug Manufacturers Association, would have required a prescription only 20 years ago. The 600-plus products are now available without a prescription because FDA, in cooperation `with panels of outside experts, determined they could be used safely and effectively without a doctor's supervision. In the last year and a half alone, FDA has given OTC approval to drugs with such household names as Children's Advil and Children's Motrin (ibuprofen), Orudis KT (ketoprofen) and Actron (naproxen sodium), for pain relief and fever reduction, Femstat 3 (butoconazole nitrate) for vaginal yeast infection; Pepcid AC (famotidine), Tagamet HB (cimetidine), Zantac 75 (ranitidine hydrochloride@, and Axid AR (nizatidine), for heartburn, and Rogaine (minoxidil) for hair growth. 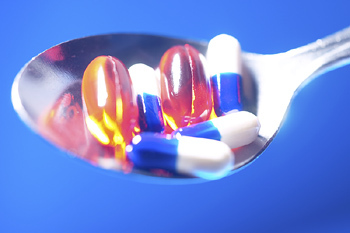 Over-the-counter switches provide increased access to effective drugs. Eighty-five percent of Americans feel it is important to have OTC medications available to relieve minor medical problems, according to a 1992 Heller Research Group study of Self Medication in the '90s: Practices and Perceptions." "There is an important trend toward consumer participation in their own health care," says Debra Bowen, M.D., director of FDA's division of over-the-counter drug products. "It's part of our mission to keep up with the consumers, wish to be more involved." Switches have a huge impact on the health-care economy. The greater availability of medicines over the counter saves approximately $20 billion each year, according to the $20 Physicians' Desk Reference for Nonprescription Drugs, a book of drug information published annually by Medical Economics in cooperation with drug manufacturers. The $20 billion takes into account prescription costs, doctor visits, lost time from work, insurance costs, and travel. The original Federal Food, Drug, and Cosmetic Act of 1938 made no clear-cut distinction between Rx and OTC drugs. The 1951 Durham-Humphrey amendments to the act set up specific standards for classification. Some drugs are approved initially as OTC drugs. More often, though, medications are first approved Rx and later switched. "While a product is available by prescription, we can learn about the. drug's safety profile in a much more controlled environment," Bowen says. Drugs are commonly switched one of two ways: under the "OTC drug review," or by a manufacturer's submission of additional information to the original drug application. The OTC drug review is an ongoing assessment by panels of nongovernment experts of the effectiveness of all drugs approved before 1962, before proof of efficacy was a requirement. The panels also review prescription ingredients to determine if some are appropriate for, OTC marketing. About 40 former prescription-only drug ingredients have been switched by this process. The second common path to OTC approval is submission of data to FDA (almost always by a manufacturer) showing the drug is appropriate for self-administration. Often the submission includes studies showing that the product's labeling can be read, understood and followed by the consumer without the guidance of a health-care provider. FDA reviews the new data, along with any information known about the drug from its prescription use. In almost every case, the agency has sought the recommendation of a joint advisory committee made up of members of the agency's Nonprescription Drugs Advisory Committee and another advisory committee with expertise in the type of drug being considered. Fox example, because Rogaine is for conditions of the hair and scalp, representatives of the Dermatologic and Ophthalmic Drugs Advisory Committee participated. While not bound by the advisory committee's counsel, FDA almost always follows its recommendation. When considering an Rx-to-OTC switch, the key question for FDA is whether patients alone can achieve the desired medical result without endangering their safety. No drug is absolutely safe. There are risks associated with every medication, so FDA does a benefit-to-risk comparison to determine whether it is appropriate for consumers to self-medicate with a drug for a certain use. On the safety side, the agency looks at the drug's toxicity - its potential for poisonous effects - when the drug is used according to its labeled directions, and also from foreseeable misuse of the drug. While misuse by some consumers is inevitable - some people may overmedicate on the mistaken assumption that more is better - the Heller study showed that consumers appreciate the risks of taking any drug. Ninety percent of those surveyed said medications should be used only when absolutely necessary. Seventy percent said they prefer to fight symptoms without any medication. FDA weighs a drug's safety against its benefit to patients. The agency considers whether consumers will be able to understand and follow label directions, whether patients can diagnose the condition themselves - or at least recognize the symptoms they want to treat - and whether routine medical examinations or laboratory tests are required for continued safe use of a drug. Nicotrol was the first nicotine patch for smoking cessation approved by FDA. It received an advisory committee's unanimous recommendation for a prescription-to-OTC switch on April 19, 1996. Worn for 16@ hours a day, the patch reduces nicotine cravings by providing a constant, controlled flow of nicotine into the bloodstream. The committee concluded that the benefits of the stop-smoking aid out-weigh its risks, but only after considering manufacturer McNeil Consumer Products, proposed labeling and marketing plans, and the company's studies comparing quit rates for OTC and prescription patches. The company presented data showing that prescription and OTC patch users achieved similar quit rates (19 percent of OTC users abstained in weeks 2 through 6, versus 16.6 percent of Rx users) and experienced no serious adverse reactions. McNeil demonstrated that smokers understood the proposed labeling, including the warning not to smoke while using the patch and directions on how to apply and remove the patch. According to the company, more than 80 percent of consumers used the behavioral modification materials, including handbooks, an audiotape, and toll-free help-line. The committee was told that abuse was not expected to be a problem, especially for adults. The patches are not to be sold to minors and will not be distributed through vending machines. Advertising will be targeted to adults. FDA agreed that the benefits of the patch - an increased chance for people to quit smoking - outweighed any slight risks, and approved the product for OTC sale last July 3. The OTC patches became available in retail stores July 18.